At Impact Trophies & Medals, we offer a huge range of golf trophies, medals and awards suited to any golfing event or competition. Our extensive range includes golfer trophies, figure top golf ball awards and glass trophies for golf. Impact Trophies & Medals are a leading retailer of golf trophies & awards. 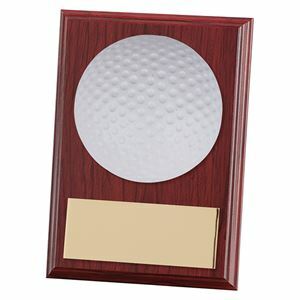 Great for personalisation, many of our golfing trophies and golf ball awards can be personalised with free self adhesive engraved text plates and printed logo inserts, to perfectly meet all your golf day or club presentation needs. Cast from a premium grade plastic, the Slipstream Golf Trophy offers exceptional value. 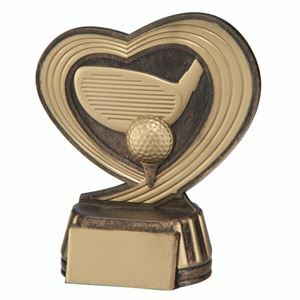 The heart shaped trophy sits on a small base and features the image of a golf driver and a golf ball. Finished in an antique gold and bronze effect, the trophy has been glazed for a lustrous finish. The Male Golf Trophy Figure Top is a high quality glazed plastic figure top compatible with a selection of trophy bases. 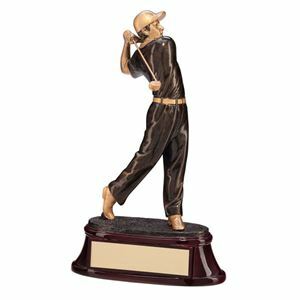 Available in a choice of 2 finishes, the trophy figure top features a male golfer with a golf club sung over one shoulder. The Male Golf Trophy Figure Top is available in antique gold and antique silver finishes and has a simple screw fixing on the bottom of the figure to ensure easy assembly with your choice of compatible trophy base (sold separately). The Micro Golf Trophy is made from high quality resin coated in a high shine glaze. The trophy features a large golf ball, with dimple detail, set on top of a rippled riser. 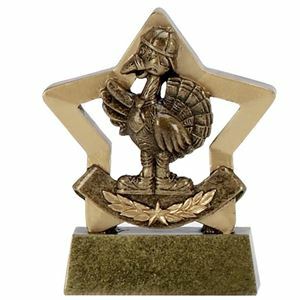 The Mini Star Turkey Trophy is made of resin and features a turkey wearing a hat, set inside of a golden star shaped frame. The trophy sits on top of an antique gold base perfect for adding one of our FREE self adhesive engraved plates. The Supreme Gold Golf Trophy is a metallic gold golf trophy made from high quality plastic. Set on a round tiered riser, a three dimensional golf ball is displayed, finished with realistic dimpling. 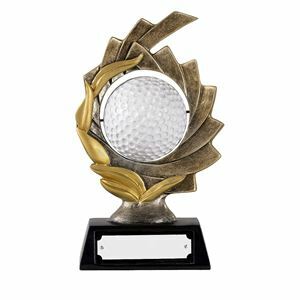 This competitively priced trophy is set upon a trapezoid shaped base with space for optional personalisation and would make a versatile award for any golfing prize giving event. This award measures a petite 10cm tall, yet despite its size offers a high level of detail. The award is crafted from a clear, polished acrylic and is formed into a star shape, colour printed with a photographic image. Showcasing the close up of a golf club and golf ball, the image is framed by a gold star outline and topped with a red GOLF banner. The Mini-Star Golf Acrylic Plaque comes with a black polished trophy base which the plaque neatly clips on to, leaving space for a personalised inscription to be displayed. Offering extremely good value for money, this rectangular wooden Horizon Golf Plaque would make a great budget award. Made from quality veneered wood, this plaque is finished with bevelled edges and displays a large depiction of a white golf ball, as if emerging from the face of the plaque. There is room beneath for a personalised dedication, creating the perfect bespoke award for your event. 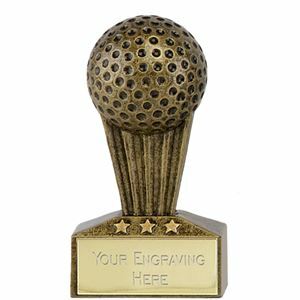 The Spinning Golf Ball Gold Award is a high quality glazed resin trophy with a spinning white golf ball in the corner of the trophy. Decorated with traditional golf dimples and etched with a golf bag and putting green detail. 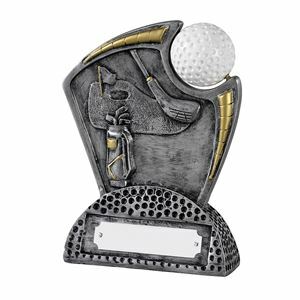 Made from high quality glazed resin, the Spinning Golf Ball Silver Award is a premium golf trophy displaying a spinning golf ball set on the corner of the plaque. The centre of the golf trophy displays a golf bag and etched putting green. The Vista Golf Cup Trophy is a premium silver resin award, available in a choice of 4 sizes. Set upon a rectangular base, a large silver golf ball embossed plaque sits vertically with a claret jug positioned to the right hand side. A round recess on the left can be personalised with an optional logo insert and the base can hold a bespoke name plate. 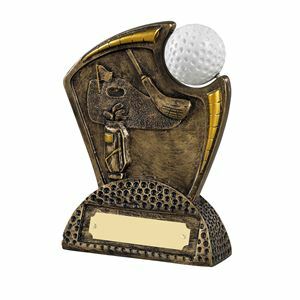 The Spinning Golf Ball Antique Bronze Award is a high quality bronze glazed resin trophy featuring a spinning white golf ball in the centre of the laurel style frame. The Spinning Golf Ball Antique Bronze Award stands on a black trophy base. 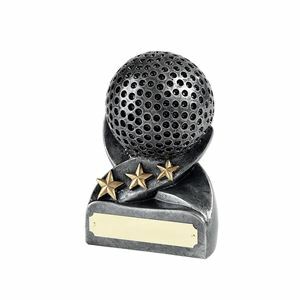 Made from antique silver glazed resin, the Golf Ball Award is a premium small golf award suitable for any golfing prize. This high quality award is decorated with 3 golden stars and can hold a personalised engraved text plate on the base.